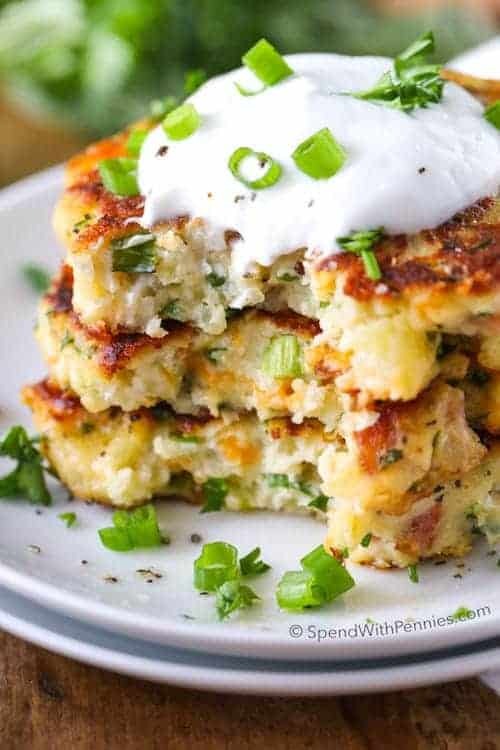 These Leftover Mashed Potato Cakes make an amazing side dish or light dinner or lunch! 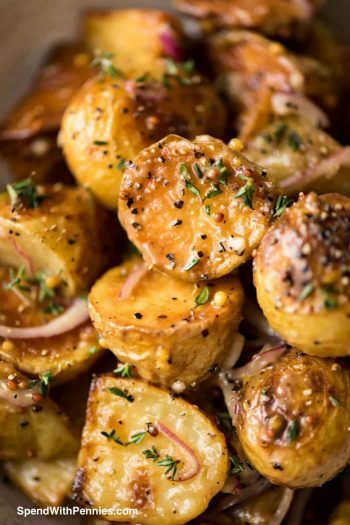 These are the perfect way to enjoy leftover potatoes and the flavor combinations are endless! If you’re anything like me, I always seem to make extra mashed potatoes ‘just in case’. I’m not sure why because I’ve never run out but somehow I always end up with leftovers. 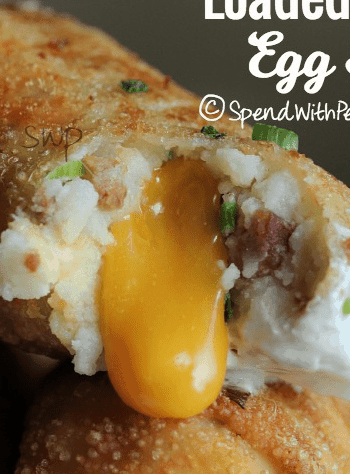 Of course they’re good to just reheat or to use in Loaded Mashed Potato Egg Rolls but my absolute favorite way to enjoy them is this recipe. Mashed potato pancakes make leftover mashed potatoes (with a few easy additions), into a new family favorite! 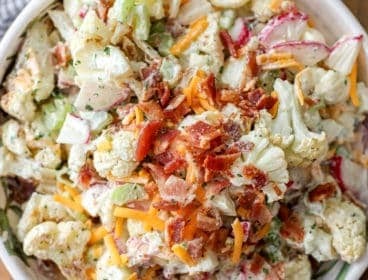 You can just add a little cheese and seasonings to make a side but if you want to turn this into a light meal or hearty lunch, add in some leftover chicken or turkey (or even stuffing)! Mashed potatoes are easy to make (and even easier to make in the crock pot) so I often will boil up some potatoes just so we have enough mashed potatoes to make these mashed potato cakes! You can really get creative with the seasonings and add ins in this easy recipe! Pretty much anything in your fridge is game… add some spices & herbs, a little bit of meat/protein and whatever veggies you have on hand! They can be topped with sour cream, extra bacon bits, sautéed veggies, ketchup, sausage and eggs, basically anything you might have handy! Fry the bacon until crispy and drain on a paper towel until cool. Crumble into small bits. Place the bacon bits into a large bowl. Pour off all but 2 tbsp of bacon grease from the frying pan and cook the garlic, and white onion if using, over medium heat until translucent. (If using green onion, no need to precook). Add to the bacon bits along with remaining ingredients (except butter/margarine) and blend well with a spoon or your hands (it’ll be sticky). Wash and dry your frying pan, then melt 1 tbsp of butter or margarine in it over medium heat. Scoop up about 1/4 of a cup of the potato mixture and form it into a ball. Place it in the hot pan, flattening it out until it’s about 1/2 – 3/4″ thick. Fry for about 3 minutes on each side, until they are lightly golden brown. For best results, serve immediately, while hot and crispy. Top with green onions, sour cream or ketchup. *Depending on the consistency of your potatoes, you may need a little bit less flour (or a little bit more). You want the cakes to stick together (and not be too sticky). *Nutrition information provided is an estimate and will vary based on cooking methods and brands of ingredients used. 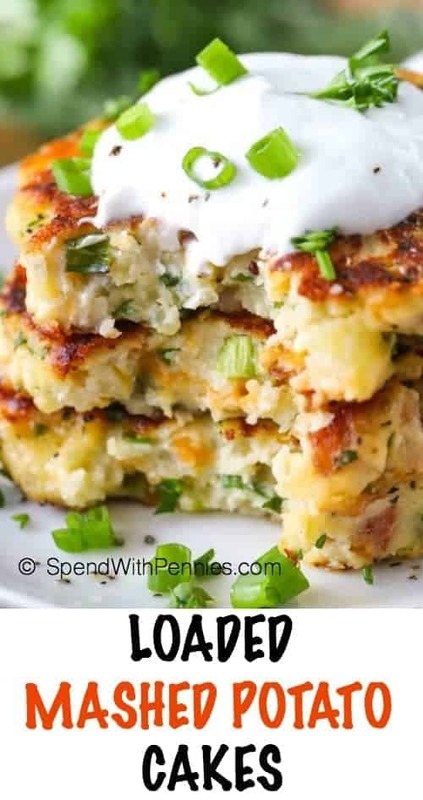 This Loaded Mashed Potato Cakes recipe is such a great way to take boring leftover potatoes and create a unique and delicious side dish that you will be sure to love! Far exceeded my expectations. Yum and easy. I am so glad you enjoyed this recipe Keith! Tried it and liked it however; next time I will roll the gushy patties in breadcrumbs and put them in the oven instead: I’m want to cut back on butter/margarine etc. That sounds like a great idea to me Johanne! Let us know how they turn out for you. I just finished making these. The flavor is great. I changed a few small things. Also mine should have had a little more flour and cheese. I started with some leftover kfc mashed potatoes, which are thin to start with. I’ll keep a few out for dinner and heat them up in the air fryer. The rest will get frozen. Thanks for this I will definitely do this again. I love the idea of freezing then popping into the air fryer as desired! Thanks for sharing Shelby! I am almost 80 yr’s old and my Mother made these for our dinner frequently. They were called potato patties. never have had w cheese. can’t wait to try your recipe. sounds wonderful. 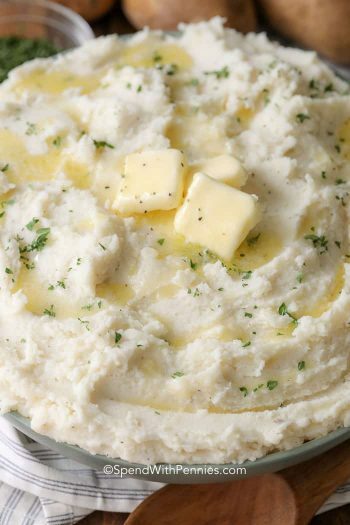 I will never toss out left over mashed potatoes again! This recipe was a hit! I didn’t have green onions so I sautéed a quarter onion and then added I small clove garlic for the last minute. My recipe was half the portion because I only had one cup of potatoes left over. This would go nicely as a side dish for any meat entree as well. Glad you loved them Liz! Great recipe , these were delish! So glad you loved them Debbie! I made these tonight since I had leftover mashed potatoes and all but the fresh herbs but I used dried in it’s p,ace. I also decided to bake them in the oven as another person mentioned and they came out great. My husband loved them, as did I. So glad you loved them Patty! They’re a great way to use up those leftovers! Excellent mashed potato pancakes! I did not have bacon so I used garlic powder but everything else was as specified. I used green onions. My husband loves them too! So glad you loved them Cindy! Absolutely scrumptious! I made ‘nugget’ sized versions and baked mine in a hot oven because I hate frying. My children were begging for more and it was really hard to stop at one. Great idea Michele! Love to hear that your children loved them so much too! Fantastic recipe! Thanks so much for all of the comments and recipe notes, they really helped! I used leftover twice-bakec potatoes and leftover steak added. Came out GREAT! This is a 5 star “keeper”. So glad you loved it Al! Sorry these didn’t work out for you Melissa, our family loves them! What would you use as an egg replacement for these please? I’ve only made this was written. Depending on the consistency of your potatoes, you can skip the egg if they’ll hold together. The egg is used as a binder in this recipe. Everyone loved these it was a real hit. The only thing I changed was adding a little hunk of shredded Swiss cheese. Used my cast iron skillet and they browned beautifully just like the picture. So glad to hear Elaine! Yum! Just what I was looking for. Thank you for helping me be creative and use what I had in the fridge. The fresh basil was such a nice touch. They were delicious! You’re so welcome Lissette! Glad you loved it! Made these tonight with leftover garlic mashed potatoes and they were excellent. We were surprised at how the basil and parsley added to the yummy flavor without standing out. I only used one egg since everything held together fine with just the one and only added 1/2 teaspoon salt since there was already some in the potatoes and it was perfect. I will definitely make these again. Thanks for the recipe! I’m so glad you loved them Shari! I have tried many recipes similar without success. This was absolutely delicious! Thank you for sharing. Item No. 2 seems to be messed up. It starts off by talking about onions then says to put the garlic in the pan? If using white onion, it is added in step 2 with the garlic. If using green onion, no precooking needed. Updated, hope that helps Monty! 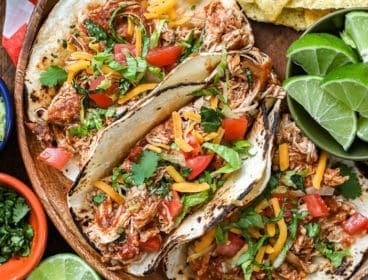 I made these and found them to be quite flavorful! I was wondering if you might be more specific on the skillet temperature. From the recipe, I couldn’t quite get a handle as to how hot my skillet should be. I use an infrared thermometer to help me with sauteing and searing. I cooked the cakes at 280 F, and they didn’t brown all that well at 3 minutes I cook pancakes at 350 to 375 F. America’s Test Kitchen suggests using 350 F and a quarter inch of oil for latkes. I placed a poached egg on each pancake with a basil chiffonade and got many compliments from my brunch guests. Hi Holly, What alternative gluten free flour would you recommend for this delicious recipe? I don’t follow a gluten free diet, so I’m not sure what the best option would be. I used “Cup4cup” multipurpose gluten free flour. I’m sure you could use rice flour, but you would have to add xanthan gum. I have had lots of trial and error over the years, converting regular recipes to gluten free. Hope that helps! I made these cakes with sauteed onion, a shredded slice of both cheddar and gouda, salt, pepper and they came out AMAZING! Easy and delish. Not as floury as other recipes i found. 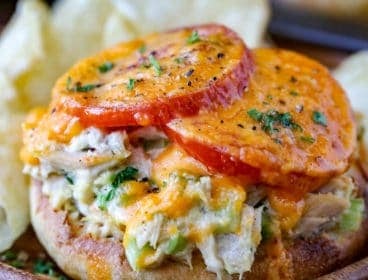 Gouda sounds like a perfect variation for this recipe! Thanks for sharing! This recipe was great. Family was eating them so fast, I couldn’t keep up. Make this you’ll want leftovers all the time. Thank you for the recipe. I am so glad that you enjoyed this recipe! Great to get a new recipe for these. We had them growing up as well. And extra boiled potatoes were fried for breakfast – funny how things go round in circles – reducing food waste is the thing nowadays too – lol! I love the idea of frying leftover potatoes for breakfast! I am so glad you liked this recipe Bec! So tasty. You can add different leftovers to recipeYou don’t waste anything. Thankyou Holly. Very Practical !! I couldn’t exactly tell what went in the potato mixture and what went on top. I mixed in the bacon cheese and some green onions and then also put some green onions on top. Served with cheesy scrambled eggs and an extra slice of bacon on top although a nicely fried egg might be better. Unfortunately I added too much flour and mine were a touch too dense as a result of that and the overmixing I may have done trying to figure out what went in the potato mixture. Fun idea though! Thank you. Overall enjoyed! I made these this morning. I found the directions a bit confusing and the garlic maybe a little unnecessary. Will definitely follow instructions to watch the amount of flour next time as my mashed potatoes were already fairly starchy from having been baked in the oven. Thanks for the fun idea! Am I the only one that thinks these should be fried in the bacon grease? Yum! Bacon makes everything better! I thought the same thing about frying them in bacon grease but I was out of bacon! 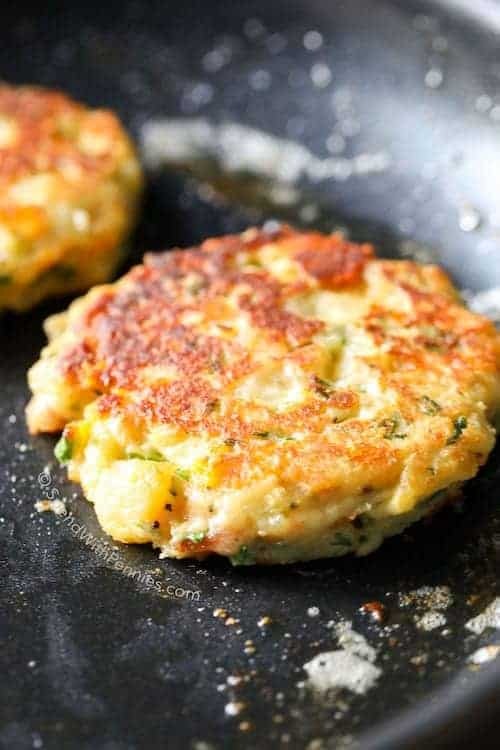 Can these lovely potatoe patties be made with packaged mashed potatoes? LOVE,LOVE,LOVE these. 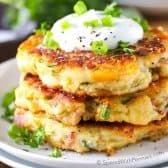 I did research on potato cakes and most all of them were about the same until I came across yours! I’ve made potatoe cakes before but I wanted something with more flavor. I made these tonight, The only substition was using a left over shallot and replacing basil with fresh chives, and also using green onion to boot! I love that you included to add all kinds of extras one might have in their fridge. These were a HUGE hit which means they will become apart of our regular left-over mashed potatoes recipe! Thank you so much. I do want to note that the prep time and cook time actually take more time than stated, it was more involved than the recipe stated – probaby double the time, otherwise it was DELICIOUS!! I’m so glad you loved them Gwyn. :) Thank you for stopping by! I made these tonight and they were a big hit! I don’t normally make potato cakes so I researched online a lot of the recipes. Your recipe was the one that really caught my eye because it seemed to pop with flavor. I was right! The only change I made was to substitute the basil for chives. Otherwise I followed the recipe exactly. Hubby said “now we have a really good recipe for using left over mashed potatoes!” Thank you for a wonderful recipe. I did notice that the closer to 3/4 inch they were the tastier they seemed to be. I had a large shallot in my fridge that needed to be used so I used that along with some green onions. Yummy!! I am so glad your family enjoyed this recipe Gwyn! 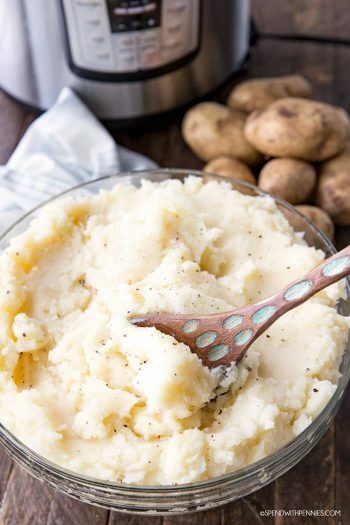 It is really a delicious way to use the leftover mashed potatoes! So glad you loved them Annette! I would love to make this recipe, but because it calls for eggs I’ve hesitated. I can’t have eggs. Period. Is there something I can substitute for them? I have only made it as written, but you could try just omitting the eggs. Let me know how it turns out if you try it. Thank you Mary! :) Yes, these freeze well. Made these …..oh so good. My Mom always made her Fish Cakes that way with a little chopped onion in them and of course the the cooked fish. I personally like to cook the salt Cod to make fish cakes. 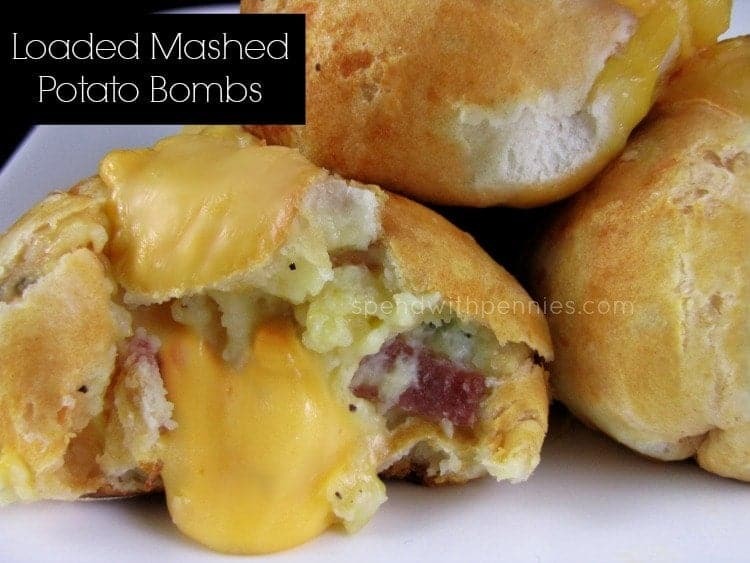 I would make mashed potatoes JUST to make these! Can’t find the recipe for loaded mashed potatoes! Where is it? Just scroll up from the comments and you will see the recipe on this page. These would be gluten free without the flour! 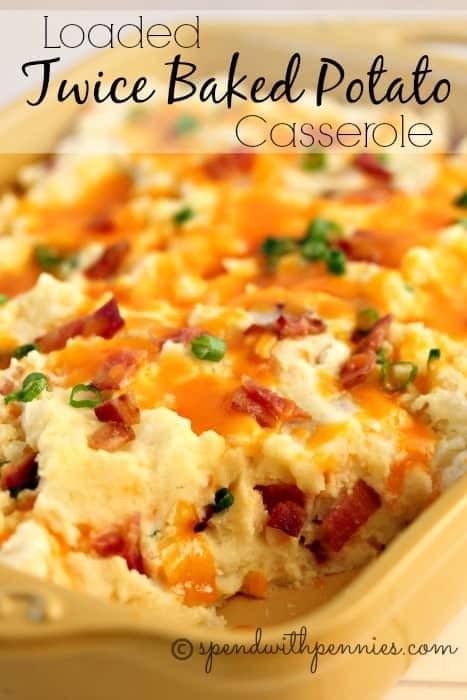 Next time when I have leftover mashed potatoes, I’m going to surprise my family with this recipe! You can Repin this recipe here. I’d forgotten my mom made these when I was growing up. They were delicious. I’m going to give them a try. I haven’t tried freezing these so I can’t say for sure. While it would likely work, the texture of potatoes can sometimes change once frozen. 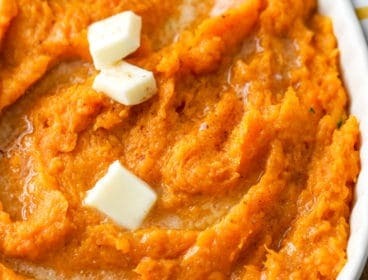 Would this recipe work with mashed sweet potatoes? I’ve got leftover smoked turkey to use up and was thinking this might be modified for southwestern flavors. I haven’t tried it but I can’t see why it wouldn’t work. You may need to cook them on a slightly lower temperature for a little bit longer to have them caramelize without burning. That would be wonderful with this recipe! I went and made up the batter and am going to refrigerate to make tomorrow or the next day so I can take them into work. Hoping this works but I think the flavors will simply just blend as sitting…..I’ll let you know how it all works out…. 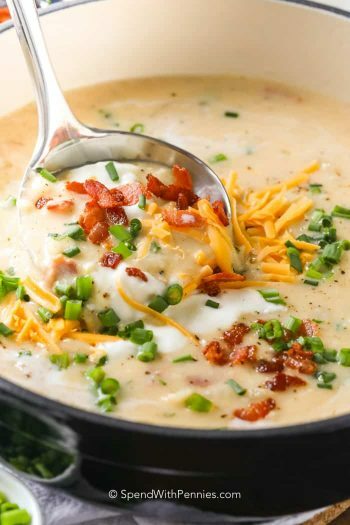 These are great – a fantastic way to use left over mashed potato – and all winners with the flavors! My family will love these! So glad it was a hit with your family, it’s one of our favorites too! I love finding and trying new recipes. We always made cakes with leftover mashed potatoes! You can freeze for soup thickening and my grandmother made the best mashed potato doughnuts and pioneer candy. Using them to thicken soup is such a great idea Annie! Thank you for sharing! Love this recipe! My fave restaurant serves Parmesan potato cakes with dill sauce. So yummy to use those ingredients with it. I confess that I cheat. I use bob Evans prepared mashed potatoes. Just add some extra flour since they’re a bit thin otherwise. I grew up on these made in a simply fashion: left-over mashed potatoes, egg, & enough flour to thicken. They were fried in bacon grease (kept in a tin container on the back of the stove) so therefore didn’t need to actually add the bacon bits. I will have to try this!!! Sooo delicious! * which i was going for since im used to latkes and wanted something entirely different. 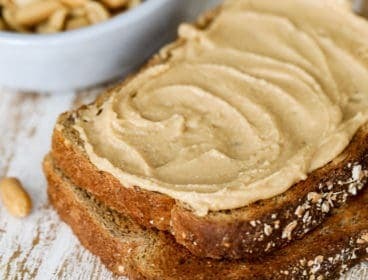 Delish recipe! So glad you enjoyed it! I agree, definitely not a latke (which are one of my personal favorite!!). I use a cheese shredder for my Latkes! I made these tonight using instant mashed potatoes. The outside was crispy and the inside was smooth mashed potato texture… These are nothing like Potato Latkes…These taste like mashed potatoes had a baby with a baked potato and then eloped with a tater tot. The only latke recipe i use is very authentic and prepared entirely different. No mashing of anything! 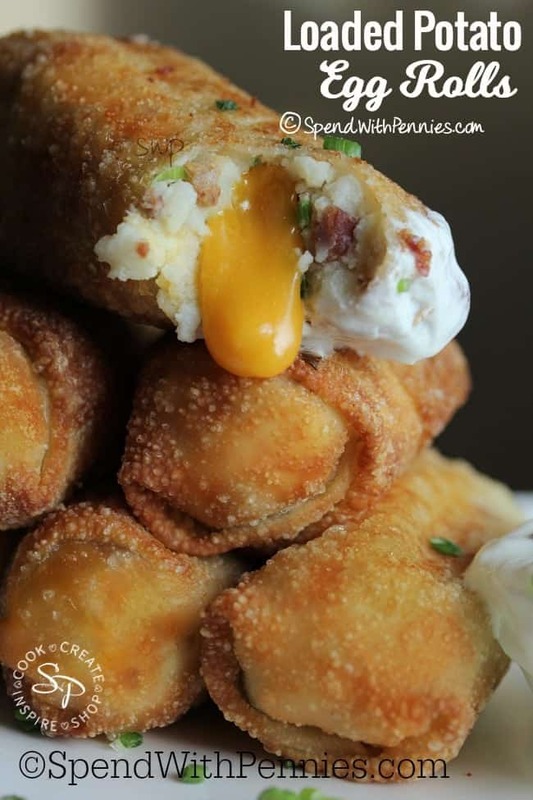 Wow these look awesome, will be giving this recipe a try soon! My mom made these for years, she only added the two eggs to whatever potatoes she had left. Then she would not even measure the flour, she just added until it stuck together. She didn’t add any more salt and pepper because they were already in the potatoes. Then she would cook them like pan cakes. The kids ate them better that way and just after World War II there wasn’t a lot of extra things to add. Brenda – during WW II, we could not get many things in the grocery stores. My dad was a store manager, but we had to have stamps to get what we were allowed. No sugar, margarine came as a white greasy substance in a cellophane bag with a yellow capsule to burst and mix. I made potato cakes for my daughters growing up with left over mashed potatoes, chopped onion, flour and fry them in hot oil. do they freeze well? 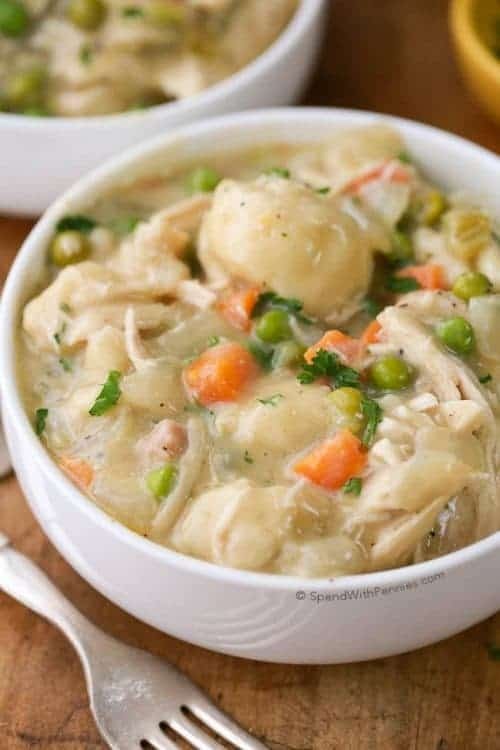 I’m sure it is delicious, and I’d love to make some extra to throw in the freezer for right after my little guy gets here in Oct, since I won’t be cooking so much then… I would probably reheat in the oven, I think. I’ve never tried it!! You can buy frozen stuffed potatoes which is very similar so I would think it would work! 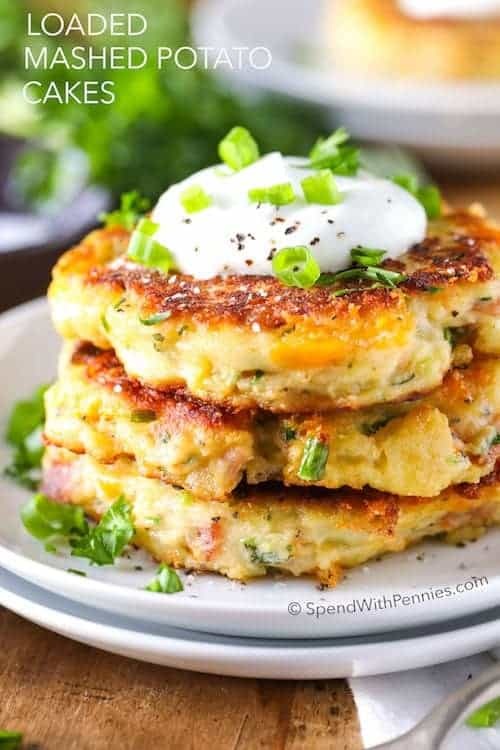 Question for you – can you make these potato cakes using instant potatoes? They look so darn yummy! I just tried these and they were really good. They were also pretty simple to throw together. Thanks for sharing this recipe. Can these be baked instead? I haven’t tried it but I bet they could! I would suggest brushing with a little bit of butter before putting them in the oven! Let us know how it works out for you! That sounds delicious too! And really nice and simple to just pop it in the oven! Thank you for sharing! These look absolutely incredible! Just pinned! 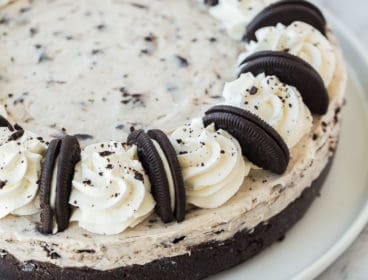 I’m drooling over here, looks soooo yummy. Thanks for the recipe! This is a fantastic idea. 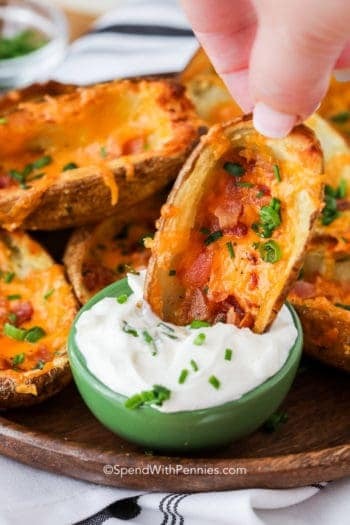 Love the play on a loaded baked potato. Pinning these to try. Saw them on melt in your month monday. I grew up eating tater cakes. They’re delicious!